Tram 52 was repainted in 1940, which gives a good date for the picture. It may have been taken on the same day that Ernie Parnell retired and was photographed with the same tram close to Navigation Bridge. 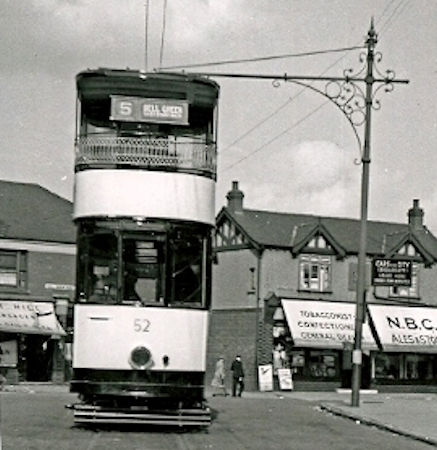 The picture was taken from the direction of Courthouse Green, looking towards the Henley Road/Hall Green Road junction. It may have been a hot day because all the shops have their Sun blinds fully extended. The buildings remain substantially unchanged.